Yesterday, we made a pretty big announcement — the first three Weekend Workshops are HERE. 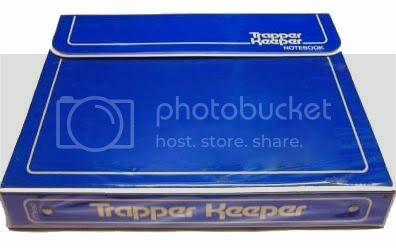 Grab your favorite pencil case and snazzy Trapper Keeper, it’s time to go back to school! Don’t worry — you can stay in your PJ’s, skip the bus, and get your learnin’ on without ever leaving your desk chair. Plus, *you* will pick the best days and times to step into our virtual classroom. Because the interwebs are amazing! Each of our three workshops (Facebook Facelift, Mailing List Magic, and Plan Your Own Blog Tour) consists of six, step-by-step video lessons you can take when it fits in *your* schedule. Even better, these courses are *not* theory-laden snoozefests. Each workshop is a down-and-dirty hands-on experience in building a major piece of your author abode from the ground up, led by your fearless (and fun) instructors — the Duolit team! So grab your gloves and let’s dig in, starting with the Facebook Facelift Workshop. Why is Facebook worth your time? As of May 2013, Facebook has 1.11 billion users. That’s a lot of people — more than three times the population of the entire United States. By comparison, Twitter has 500 million users, Google + has 343 million, and Pinterest has 48.7 million. With such a large, diverse, and active group of users (665 million users log-in on a daily basis) you are statistically bound to find some interested readers who *will* become your crazy-dedicated fans on Facebook. But to connect with them you need a *great* Facebook page, a strategy to find new fans, and a plan to post content they will love. Here’s the course breakdown: I will give you all of the above without sacrificing a huge chunk of your time. What the heck is the difference between pages and profiles? How can your cover photo get you in trouble? What makes a great profile photo? How often should you change your cover photo? Why is this so important? How can you link your website, Amazon author page, and other social media accounts to Facebook? What’s the ONLY way you can legally have a contest on Facebook? What are the different types of posts (and which are most popular)? What’s the secret to boosting fan interaction? How can you find more fans for free? What’s the deal with Facebook ads and how do you set one up? 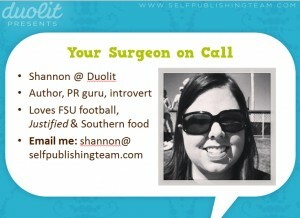 How can you turn your reader profile into posts your fans will love? Why will a Facebook posting schedule save you time and frustration? Each lesson contains 5 – 6 short videos with a slideshow (also available for a PDF download) and narration by your surgeon-on-call, me (Shannon)! Don’t worry, I’m not the newbie in the O.R. either — in my last job, I taught in-person Facebook workshops to small business owners here in St. Augustine. So my previous instructor experience combined with my time in the trenches as an author trying to grow my own Facebook fan club gives me the perfect knowledge base and steady hands to lead you in this operation. Whether you have an existing Facebook fan page or need to create one from scratch, this course will help you. Hop over to Udemy, grab the keys, and take the Facebook Facelift workshop for a test drive! You can watch the first three videos of Lesson 1 (Introduction, 5 Mind-Blowing Facts About Facebook, and Profiles vs. Pages: What’s the difference?) for free on the course page at Udemy. 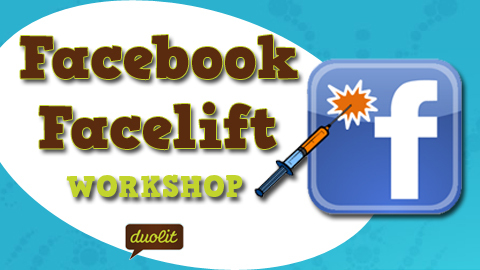 Do you have any other questions about the Facebook Facelift Workshop? Give me a shout in the comments or shoot me an email if you want more information, I’m happy to jump out of my scrubs on and give you a consultation! Check back tomorrow when Toni shares all the details about her Mailing List Magic workshop! Hi Alan! I’m sorry you had those issues with the blog tours and your Facebook page — there are so many variables there that it can be amazingly difficult and frustrating to tackle them yourself. It can feel like hacking a trail through a forest full of underbrush and brambles — slow and exhausting work at best. What we’ve done with the workshops is simply clear the path for you so you can focus on tackling the process with confidence. If the topics aren’t for you, though, that’s totally cool. We’re just glad you’ve found something (your blog) that is working well! So much of book marketing is about trying a bit of this and that and finding what works best for you and your readers. Sounds great. I’ll take the free preview on Friday and the Facebook course on Saturday. What about other social media workshops such as Twitter and Pinterest? Can you do that? Thanks. Hi Linda! We definitely want to add new workshops that explore some of the other social media networks, too! I’m also working on a post about Pinterest (it should be up on the blog around June 12th!) so keep an eye out for that. Yoohoo! Looking forward the new workshops. Shannon, I’m not sure if I accessed the correct free Facebook Facelift workshop. My plan was to do the free workshop today, Friday, and then pay for the full workshop and begin it on Saturday. For the free preview, I only saw two lessons with the “free” banner, correct? Also, I imagine that I can start the full workshop and come back to it later, right? Oh! I love this idea. This seems a very cool one. I will be able to learn more about Facebook in the comforts of my home. But I wonder if how each workshop cost.